Breaking this contradiction meant launching struggles everywhere in order to make housework cost. But it was also a great cultural awakening. The theme of housework asserted itself across the Feminist Movement in place of emancipation through work outside the home, even in those circuits that did not seek to require its salarization. Women increasingly rejected a femininity made ​​of endless willingness to reproduce others for free. There was also a broad commitment to promoting women’s information on what today would be called “reproductive health” and urging the State to do it. The amount of work that was dedicated to building knowledge about everything related to women’s health, which was spread through small pamphlets, mimeographs and books, is amazing. In truth, the books are small and this shows that there was little time to write them and little time to read them, since much of the time was devoted to organization and action. And publishers could not make big investments so the books had to be of limited size and essentially sold. Two such examples are the Marsilio series entitled “Salario al lavoro domestico – strategia internazionale femminista” (“Wages for Housework – International Feminist Strategy”) and the book Un lavoro d’amore (The Work of Love), by Giovanna F. Dalla Costa, a fundamental essay on the relationship between physical sexual violence and the gratuity of housework, published by Edizioni delle Donne in Rome in 1978. Keep in mind that this building of another knowledge by the Feminist Movement was part of a horizon of construction of other knowledge conducted in the ‘70s by various movements. 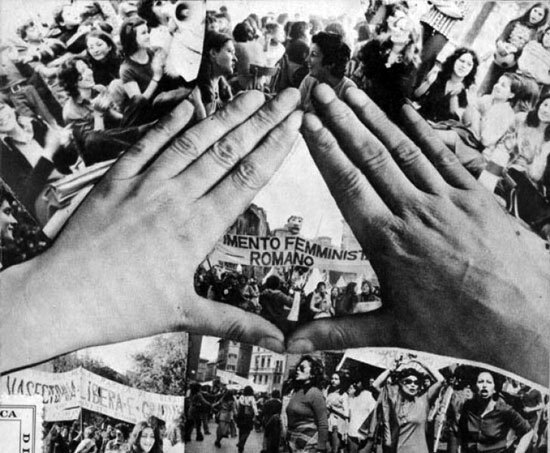 In Padua in 1974, the Committee for the SLD that had taken over from Lotta Femminista opened the first self-managed family planning clinic which would be followed by others in other cities. In this clinic many women and doctors willingly provided their services for free. The law (no. 405) establishing family planning clinics would come in 1975 while previously, in 1971, the legislation (art. 553 c.p.) prohibiting the advertising of contraceptives had been declared unconstitutional by the Constitutional Court. The number of these clinics, however, would always remain far below what was expected and deficient in their functions of providing information and prevention. Much effort was made on the issue of childbirth to return it to the condition of a natural event, as opposed to its excessive medicalization, and to return to the woman the lead role with the right to have at that event the comfort of a trusted person. The Movement paid particular attention to the maternity wards in hospitals and the struggle at the St. Anna of Ferrara hospital remains famous. But overall, the whole field of gynecology was indicted, being still largely in the hands of male doctors, often authoritarian and rough in their relationships with patients. Inquiries were also held in public clinics where women, often posing as patients, went to test the quality of the service. All around maternity there was a hum of feminist research: the Movement for active birth was outlined; Andria, a national coordination of obstetricians, gynecologists and midwives who were particularly attentive to the lesson of the Feminist Movement, was formed; Andria’s mouthpiece Istar, a multidisciplinary journal on birth, was established. The same circuit would be very important later in the ‘90s when the question of hysterectomy abuse was raised. Also keep in mind that it was workerism which had promoted the direct relationship between militants and the works of Marx. At the University and in other places, continuous lectures were made ​​on Capital; chapters 8, 24 and 25 of the first book were highlighted, dealing with the workday, original accumulation and the modern theory of colonization (or theory of systematic colonization) respectively. Such issues would come back to the forefront with the attack on common goods deployed around the planet by neoliberal globalization. Numerous studies on the various stages of capital were carried out. The discovery that there was no housework in Marx led to that set of analyses, by this circuit of scholars, which aimed to reveal the hidden phase of capitalist accumulation, that of the production and reproduction of labor power. Here we should mention, above all, the text L’arcano della riproduzione (The Arcane of Reproduction), by L. Fortunati, (Marsilio, Padua, 1981). So, also, we should mention the essay Il grande Calibano (The Great Caliban), by S. Federici and L. Fortunati, (FrancoAngeli, Mlano, 1984) that, relative to the period of original accumulation, rereads and reinterprets the trials of the witch hunts from a political point of view. This is just a first, brief mention of the fundamental texts but there are many others, representing stages of the analytical effort that was sustained, that are in the archive, representing essential components of the theoretical patrimony of the feminist strand we are dealing with.